We rented Mother from Netflix. 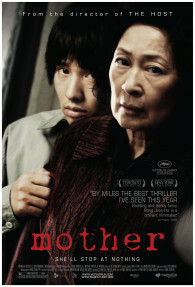 As I explained to my family before screening it, the movie’s about a crazy Asian woman and her devotion to her mentally challenged son. That said, I enjoyed the movie, although it contains a lot of profanity, which I don’t like.